It was a special night at the 2018 NBA All-Star Game on Sunday as the best players in the league gathered together at Staples Center in Los Angeles. LeBron James won his third All-Star Game MVP and no other players were happier for him than his teammates. One of his new Cleveland Cavaliers teammates, Rodney Hood, was ecstatic for James and congratulated him via Twitter. 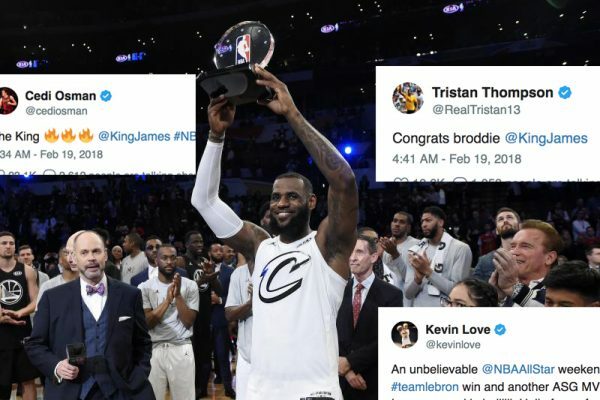 Aside from Hood, other Cavs players also joined in on congratulating the King on his All-Star MVP award. Jordan Clarkson also retweeted a video showing LeBron hoisting his MVP trophy. Hood was part of a three-way deal between the Cavs, Utah Jazz, and Sacramento Kings. The shooting guard averaged 16.8 points per game on 42.4 percent shooting for his former team. Over the past two games with the Cavs, Hood has been averaging 14.5 points on 52.4 percent shooting. From the looks of it, he’s fitting just fine as one of James’ Robins. Prior to the trade, Hood told Yahoo! Sports that he felt that he would be traded. He added that his priority was to perform and stay professional regardless of where he would be playing. Hood has proven that so far in the couple of games he has had with the Cavs. The Cavs are eyeing to continue their four-game winning streak with their leader back in a Cavaliers uniform when they face the Washington Wizards on Feb. 23.